Thomas Ferguson, PhD, Washington University Recycling cellular debris within the eye is required for maintaining good vision. 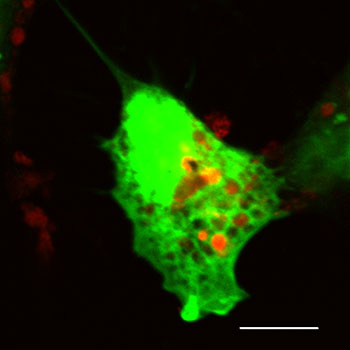 Inside retinal pigment epithelium cells, structures used for recycling (green) engulf and digest spent parts of photoreceptor cells (red). Researchers at Washington University School of Medicine in St. Louis and St. Jude Children’s Research Hospital in Memphis have found that good vision depends, at least in part, on a recycling process in the eye that mops up cellular debris and reuses light-sensitive proteins. The findings suggest that disruptions in that process may harm vision and play a key role in the development of eye diseases related to aging, including age-related macular degeneration, the leading cause of vision loss in Americans over 50. In the brain, similar defects in the recycling of proteins contribute to other disorders associated with aging, such as Alzheimer’s and Parkinson’s diseases, both of which are linked to the build up and aggregation of proteins in brain cells. The study is published online in the journal Cell. Working in mice, Ferguson and co-senior author Douglas R. Green, PhD, the Peter C. Doherty Endowed Professor Immunology at St. Jude, showed that vision suffers when the retina can’t clear away debris produced by light-sensing photoreceptor cells. The retina, located at the back of the eye, is populated with photoreceptors that absorb light and send electrical signals to the brain, allowing us to see. A key component of these photoreceptors is a light-sensitive molecule called rhodopsin. It is rhodopsin that absorbs light, but each rhodopsin molecule only works for a brief stint. Once it has been exposed to light, rhodopsin breaks down and must be recycled to use again. The key player in getting the rhodopsin recharged is a single layer of cells at the back of the retina called the retinal pigment epithelium (RPE), which recycles and recharges a molecule that rhodopsin needs to activate the photoreceptor cells. In addition, the photoreceptor cells themselves also get a little ragged after repeated exposure to light and they, too, are continually shed and renewed each day. In this new study, Ferguson and Green found that both the recycling of rhodopsin and the clearance of discarded bits of photoreceptors are initiated by a mechanism called autophagy. There is increasing evidence that when operating efficiently, autophagy can help stave off the cellular damage that occurs in age-related diseases such as Alzheimer’s, and Ferguson and his colleagues suspect it also may play a role in age-related eye diseases. But autophagy isn’t the only mechanism at work in the retina. The retinal pigment epithelium (RPE) also uses a second eating process called phagocytosis to clear away parts of the photoreceptor cells that are constantly shed in the retina. But it turns out that both autophagy — when cells eat themselves — and phagocytosis — when cells eat structures other than themselves — operate through the same pathway, the research shows. To understand how those two mechanisms operate in the eye, Ferguson and Green studied mice. In the animals, as in people, photoreceptor discs are shed early each morning. The researchers found that signs of autophagy were visible in the mouse retina throughout the day but peaked at about 7 a.m.
Next, they generated mice whose retinal pigment epithelial cells lacked a gene essential for autophagy. They also found that when the pathway was interrupted, the mice didn’t see very well. Using complex techniques to measure vision, the researchers discovered that although the mice weren’t losing photoreceptor cells, they were losing their vision. 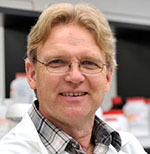 The experiments, Ferguson said, suggested that autophagy assists the visual cycle by helping cells recover vitamin A, which is essential for the recycling of rhodopsin in the photoreceptors. If that same process were to break down in humans as a function of aging, Ferguson believes it could play a role in the vision loss associated with normal aging and with diseases like macular degeneration. “If autophagy becomes less efficient in the retina as a result of aging, it could cause problems clearing away debris and maintaining the visual cycle,” he said. Because previous studies have suggested autophagy can help clear harmful proteins that accumulate in cells during Alzheimer’s and Parkinson’s disease, new drugs are being developed to boost that recycling process. Ferguson and Green think some of those drugs may be useful in combating age-related vision loss. Funding for this research comes from the National Eye Institute (NEI) and the National Institute of Allergy and Infectious Diseases (NIAID) of the National Institutes of Health (NIH). It also was supported by Research to Prevent Blindness and the BrightFocus Foundation. NIH Grant numbers EY015570, AI44848, AI40646 and EY02687. Kim JY, Zhao H, Martinez J, Doggett TA, Kolesnikov AV, Tang PH, Ablonczy Z, Chan CC, Zhou A, Green DR, Ferguson TA. Non-canonical autophagy promotes the visual cycle. Cell vol. 153 (8), published online July 18, 2013.